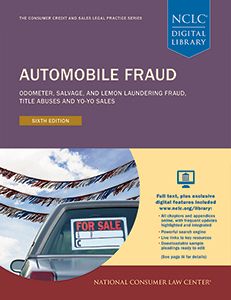 Millions of consumers are defrauded each year by dealers not disclosing a vehicle’s wreck or salvage history, true odometer reading, prior use, lemon-law buyback history, or repaired damage to brand new cars. Other frauds involve vehicle titles and “yo-yo” sales. Supreme Court punitive damage rulings. Follow the money: Finding hidden dealer assets, liability of floor planners, and more.